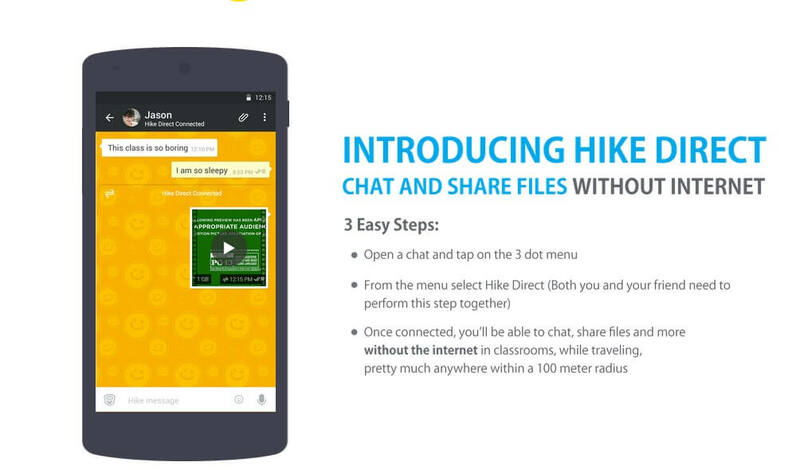 Internet company Hike Messenger has launched Hike Direct that allows users to chat and transfer photos and files without the Internet or incurring data charges. Hike Direct allows mobile devices to connect with one another directly within a 100 metre radius bypassing the telecom networks. Once connected, users can chat and share files like they would using any other messaging app. In fact, these transfers can happen directly with a speed of up to 40 Mbps. If you have to transfer 100 MB of data, it would take less than 10 seconds on Hike Direct, without any data charges. Users can get this feature by upgrading to the latest version of Hike, version 4.0.6 and above, which is available free on the Google Play Store. The downside may, however, be kept in mind: the two users cannot be more than 100 metres apart. This functionally could mean people within the same house or office could avail of the service. Hike was launched in December 2012 by Kavin Mittal, son of Bharti Airtel founder Sunil Mittal. It has about 70 million users, making it the second largest messaging app in the country.